My Little Patch of Sunshine: Crayola Back to School Gift Pack Giveaway! 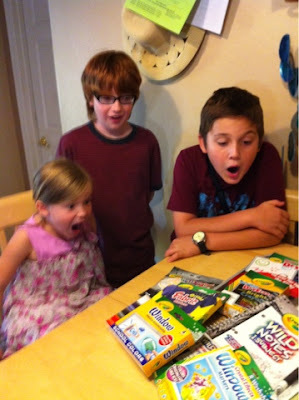 Crayola Back to School Gift Pack Giveaway! When I was a kid, I always preferred Crayola crayons over any others, and would ask my mom to get me the bright yellow box. I loved getting a box of 64 crayons with the sharpener built in! When I had kids of my own, Crayola was the brand I went to when we needed crayons or colored pencils. It was also what I looked for in other art supplies, as their products have grown over the last 100+ years to much more than crayons. Their website is full of art and craft ideas, and I love the fact that they have a solar farm that generates enough energy to create 1 billion crayons and 500 million markers a year. 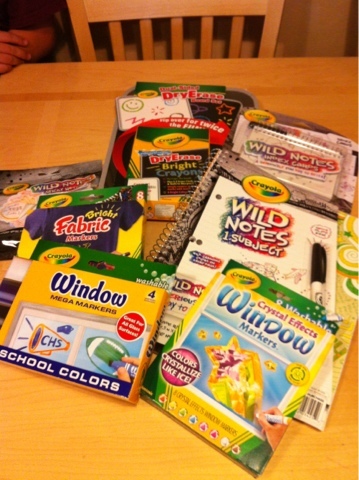 Crayola and My Blog Spark recently sent me a box of Crayola goodies to celebrate the start of the school year. When I opened the box, all 3 of my kids' eyes lit up and they were excited to see what new things they had to play with. To enter this giveaway, I need you to note the giveaway name and mandatory question listed below, then CLICK to go to my Giveaway Form and fill out the required information. I do my giveaways this way so that your email doesn't have to be left in public on my site. Only entries left on my giveaway form will count towards the giveaway; any comments left below will not be entered. Mandatory Question: What's your favorite crayon color? You will receive one extra entry if you also "like" my Facebook page. Thanks! I will choose a winner using random.org on September 5, 2012. For all my giveaway rules, please see my giveaway rules. Good Luck!! I always loved the cornflower color! All your crayola goodies sound FABULOUS and I am totally jealous! Definitely will be entering in the giveaway!